The more I travel, the less I carry. And the less I carry, the more I wear what I need and enjoy. As I approach my third year of slow travel in Latin America, dressing myself has become a bit of an art form. Like the ancient nomadic cultures, my clothing choices are inspired by practicality, movement, environmental appropriateness and protection, with personal style taking the form of adornment with regional accessories. It’s actually a pretty good system. These P^cubed Pick-Pocket Proof Pants™ by Clothing Arts, with an ingenious design for surreptitiously carrying passport, credit cards, mobile phone, etc., are perfect for modern day nomads like me. Cold weather or warm they go well with sweaters or T-shirts, boots or sandals. Better still, they’re durable and lightweight. 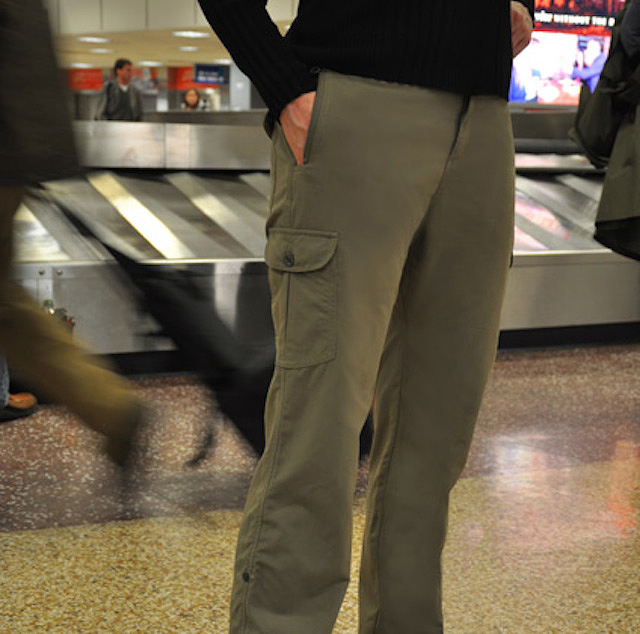 Favorite feature: Unlike a lot of cargo-style travel pants with billowing pant legs and ballooning pockets, these have a slim, attractive profile. They’re not skinny jeans, don’t get me wrong. But even when loaded down with documents and electronics, they don’t look like it. Better yet, they roll up and convert to capris for warm weather destinations. Not-so-favorite feature: You know how child-proof bottles can present a challenge to adults? Well, the zippers, buttons and pocket-within-a-pocket features on these pant pockets can present a similar problem, making retrieving items complicated until you get the hang of it. But that’s the point, isn’t it: to make access to your valuables difficult. Bottom line: There’s little more reassuring when I travel than knowing that my most important documents and essentials are safely hidden away in my clothing.Not in a purse that can be snatched. Not in a questionable hotel room safe. But always with me. Offering comfort, style and security, these pants are ideal whether I’m exploring flea markets in Buenos Aires, on safari in Africa, hiking the Provençal countryside or taking a walk around the neighborhood. P^cubed Pick-Pocket Proof Pants are available for men and women in adventure and business styles at ClothingArts.com. Suggested retail price, $99.95 USD. Win a free pair! Use the comment box below to tell me which style you’d like to travel with and on March 14, 2014, I’ll select a winner and Clothing Arts will ship the recipient the pants of their choice anywhere in the world. Monitor the comment thread to see if you’re the winner and be sure to register an e-mail address so we can contact you for shipping information.